Maharashtra chief minister Devendra Fadanvis said awards like Devi Awards will eventually lead us to a more equitable society. 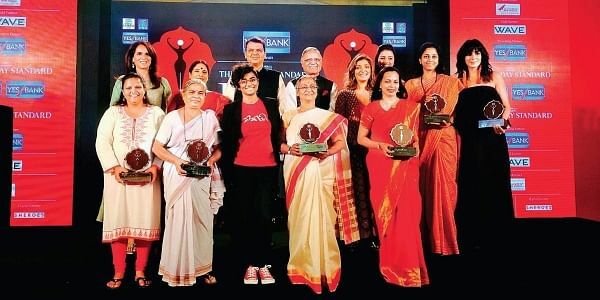 MUMBAI: Describing the Devi Awards as the best way to acknowledge the work of women in changing our society, Maharashtra chief minister Devendra Fadanvis said awards like this will eventually lead us to a more equitable society. Fadnavis presented the awards at the 11th edition of Devi Awards to 11 distinguished women achievers from all walks of life—from films and entertainment to education, social service and politics—here on Monday evening. they have been disrespected, society had seen the lowest points in its existence. “Recognising the true power of this 50 per cent of the population will make the world a better place,” Fadnavis said as he presented the awards. The awarded included fashion designer Anita Dongre, TV and film actor Shubhangi Gokhale, curator of Indian designs Divya Thakur, financial entrepreneur Rakhee Kapoor Tandon, NCP MP Supriya Sule, actress Kirti Kulhari, ‘right to pee’ activist Mumtaz Shaikh, health activist from tribal area Dr Smith Kolhe, social revolutionary Robin Chaurasiya, children’s activist Renu Gavaskar and nutrition expert Rujuta Divekar. The winners were chosen through a rating process conducted by the senior editorial team of The New Indian Express and an independent jury, using transparent methodology. They were selected on the basis of their contribution to their chosen line of work, as well as society in general.